Veer right off Queensborough Bridge onto New Westminster/6th Avenue exit. Veer left onto 6th Avenue. Follow 6th Avenue to 8th Street. Turn Left onto 8th Street. Turn right at 8th Avenue. Straight onto McBride Blvd. from bridge. Follow McBride to 8th Avenue. Turn left onto 8th Avenue. Freeway to Brunette Avenue North (second Brunette Exit) Follow Brunette to Braid Street (first light). Turn right onto Braid Follow Braid as it becomes 8th Avenue. Exit at Canada Way (exit 33). Turn left onto Canada Way. Follow Canada Way as it becomes 8th Street. Turn left onto 8th Avenue. Turn southward onto North Road. Right onto Braid Street. Follow Braid as it becomes 8th Avenue. Take the Expo Line Skytrain To New Westminster Station at Columbia and 8th Street. Take bus number 123 Brentwood Station up 8th St. to 8th Ave.
Free parking is permitted in the New Westminster Secondary parking lot adjacent to Massey Theatre on a first come, first served basis provided that vehicles are parked in designated areas and are not blocking fire lanes, doorways, loading areas or areas marked “No Parking”. Enter parking lot on 8th Avenue just east of 8th & 8th intersection. Driveway is between theatre &amp; Moody Park Arena. 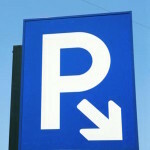 Please note that there is No Parking allowed in the Moody Park Arena section in front of their building. Note: Massey Theatre, Moody Park Arena and School District 40 reserve the right to have any illegally parked vehicles towed at the owner’s expense. Accessible Parking: Accessible parking & wheelchair accessible entrance with automatic doors is available at the rear lobby entry. 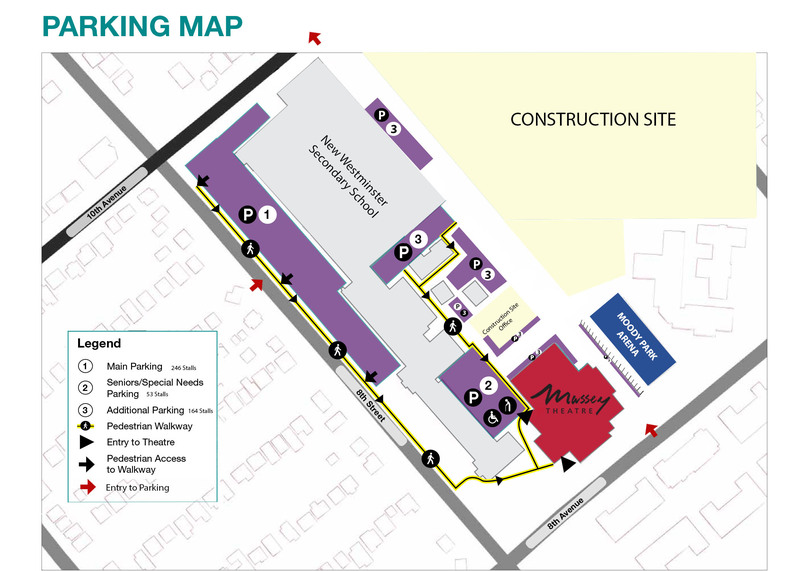 Once you enter the parking lot from 8th Avenue continue straight approximately 100 yards. Turn left around the corner of the building towards the gated parking area. Enter the gated parking lot, there are 4 wheelchair stalls and a ramp to the lobby. Parking for Handi-Dart vehicles: Available adjacent to the Loading Bay area on the left-hand side just as you enter the parking lot off 8th Avenue. Watch for a posted sign.